All version have fully illustrated courts, Aces and Jokers, custom pips, different faces and backs, and are supplied in foiled tuck boxes. Every deck includes an extra court card that represent a God of Olympus. Dedalo tells the story of many characters of the Ancient Greece. The Minotaur Asterion, the dark hero Theseus, the beautiful Ariadne and, of course, Dedalo, the genius who built the Labyrinth, the main location of the story. In Italian, Dedalo is a synonym of “Labyrinth”. The deck is high-detailed, full of hidden meanings and with accurate references to Mythology. Dedalo Alpha and Dedalo Omega tells the past and the future of the same story. Dedalo Alpha show the part when the Minotaur and Theseus haven’t fought yet, Ariadne is going to help Theseus with her red thread, and Icarus and King Aegeus are alive. In Dedalo Omega, Theseus has defeated the Minotaur and abandoned Ariadne. King Minos is angry with Dedalo and has imprisoned him and his family in the labyrinth. Dedalo manages to fly away on wings made from wax, but his son, Icarus, flies too high and his wings are melted by the Sun, Helios. Aegeus thinks Theseus was killed by the Minotaur, so he’s committing suicide. The Gods are different in each Dedalo Deck. In Dedalo Alpha you have Hermes (Jack of Spades), Aphrodite (Queen of Spades) and Poseidon (King of Spades), plus an extra Jack of Spades (Apollo). In Dedalo Omega you find Dionysus (Jack of Spades), Athena (Queen of Spades) and Helios (King of Spades), plus an extra Queen of Spades (Artemis). 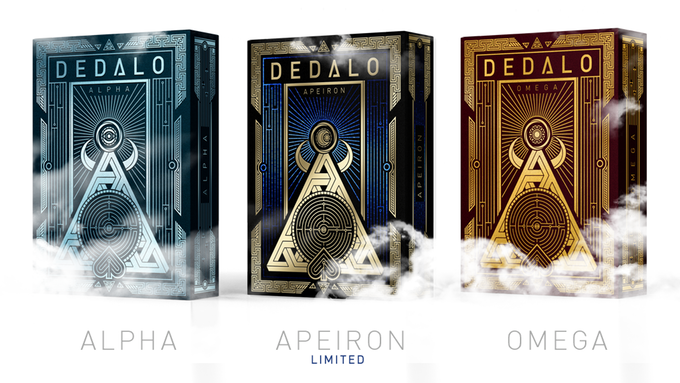 In Dedalo Apeiron you have Ares (Jack of Spades), Hera (Queen of Spades) and Zeus (King of Spades), plus an extra King of Spades (Hades). I’ll look at the stories behind some of the other Giovanni Meroni decks in future blog posts.